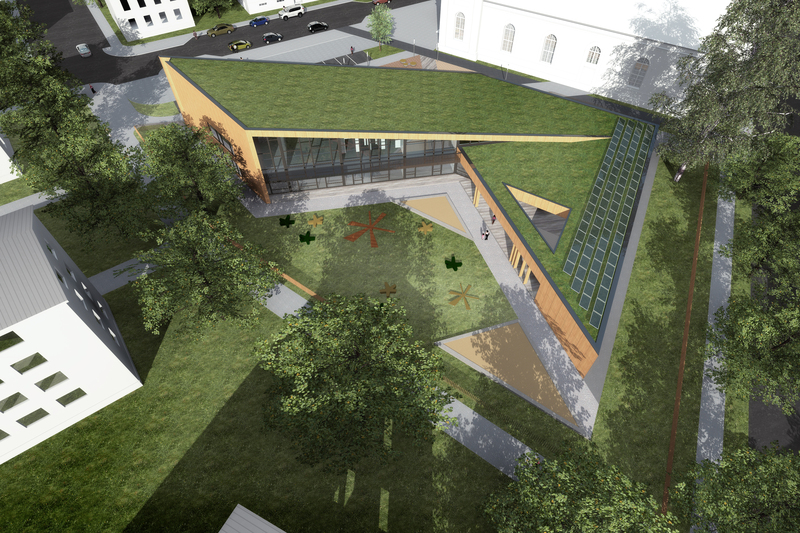 A topping-out ceremony was held at Naerumaa Kindergarten (Pepleri 1A, Tartu) on 28 November 2016. The building that will house the future kindergarten was designed as a near-zero energy structure. Solar panels are to be installed on top of the building, which will otherwise feature a grass roof. Innovative structures will ensure a high degree of insulation and the accumulation and re-use of residual energy. The optimal use of energy and production from alternative sources are guaranteed in technical systems with the use of smart control automation and cutting-edge solutions. The interior climate of the building was planned with the activities of small children in mind. All of the building materials, products and equipment used are environmentally friendly and recyclable and have a small ecological footprint. The kindergarten will be a home away from home for 144 children starting down their path of fun, learning and development in six groups. It is scheduled to open its doors in autumn 2017. Architecture: BOA OÜ architects Jürgen Lepper, Anto Savi & Margus Soonets. Amhold AS - project manager: Jaan Aru; structures: Andrei Uibukant; electrical systems and strong current: Jevgeni Jefremov.